A crab arm on the beach. 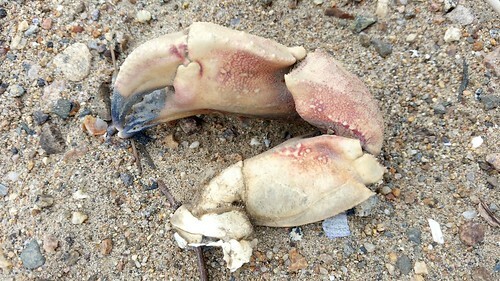 I was wandering on the beach this morning and stumbled upon this crab arm. It sat there lifeless and has probably been there for a while. In its curved state, I can still picture some crab attached to it, holding up its claw as it if was posing for a picture and flexing its biceps. I also found the range of color in in the arm impressive. I played with crabs as a kid but never really looked closely at one. The rich color of reds and beiges make it perfect for camouflage in the sandy environment in which it lives. But unfortunately, the owner of this arm is not likely among the living any more.